Did you know the peels of some fruits hold some of the most powerful nutrients in the world? 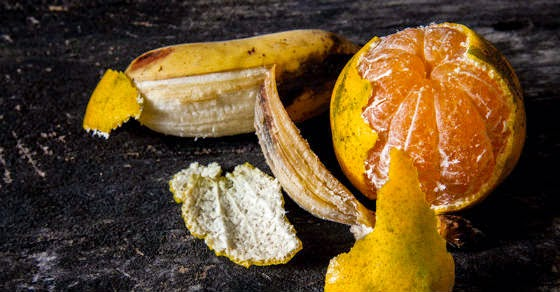 There are many uses, both medicinal and practical, for orange and banana peels that aren't known by many. So, next time you think about throwing away one of these peels, you may want to remember this information. It's always a good idea to minimize pesticide levels by choosing organic oranges. Oranges tend to be grown with lower pesticide usage than most fruits but a good cleaning with 1 tablespoon of lemon juice and 1 tablespoon of white vinegar in 1 cup of water will remove almost any pesticide with ease. An Orange's peel and apple's skin are similar because most of the nutrients are in the skin of these fruits. According to Rebecca Wood, author of The New Whole Foods Encyclopedia, “One medium orange contains over 60 flavonoids and 170 different phytonutrients.” They are good for your skin, your system and your home too. Dr. Jaishree Bhattacharjee, Ayurvedic consultant with Satvikshop helps us find out its different uses. As per Ayurveda, orange peel is tikta (bitter) and it improves digestion and can speed up your metabolism. It helps to naturally beat gas, heartburn, vomiting and acidic eructation. It's also great to perk up your appetite and relieve nausea. Due to its pacifying properties, orange peel powder helps dissolve phlegm in respiratory systems, alleviate coughs, and asthma. Most of the beneficiary aspects of orange peels come from their essential oils, which have anti-microbial and anti-inflammatory properties. Essential oil “d-limonene” has the ability to defuse stomach acids and maintain normal intestinal movements. It also promotes normal liver function. Studies have shown that orange peel can dissolve cholesterol and triglyceride. That means consumption of an orange peel can benefit obese people who have high cholesterol levels. It has a flavonoid known as hesperidine, which is said to be effective against colon cancer and osteoporosis. Essential oils from orange peels are sedative in nature so it makes them great for calming nerves and inducing sleep. Use orange peels in baths, simmer in a pot to uplift your mood, or beat insomnia naturally. Rub some orange peels on your skin gently if you have oily skin. Oily skin responds well to application of orange peels. It helps balance the skin's oil and makes your skin smoother and softer. Dried orange peel beads can act as a natural exfoliator by removing dead cells and blackheads gently and naturally. Due to its cleansing, anti inflammatory, antibacterial and antifungal properties, it works well against pimples and acne. If you use organic peels in cooking the orange zest can enhance the taste and flavor of many dishes. Dried orange peels can absorb humidity from brown sugar. Just place half a peel in the bag. Candy made with orange peels can improve your appetite and the vitamin c in them boosts your immune system. Although the sugar content in most candy weakens the immune system, choosing candy made with orange peels is a better choice if you cannot resist eating sweets. Like oranges, make sure you use organic banana peels to reduce your exposure to pesticide levels and you may even want to try the wash described above anyways. Banana peels are full of antioxidants, minerals, and vitamins, so they can naturally cure many ailments and can aid cell regeneration. Here are just a few uses, if you know of more please comment in the comment section on the bottom of this article. Research shows they have a capacity to absorb lead and copper from water. Just rub a banana peel on a bug bite to soothe the skin and reduce the itch. With regenerative properties, banana peel can speed up the healing of bruises. Rub the inside of a banana peel on your teeth for a couple of minutes every other day, and your teeth will be noticeably whiter in a few weeks. Banana peels help eliminate warts and prevent their return. Tape or somehow strap a piece of banana peel to the wart overnight for about a week or rub the banana peel on the affected area daily. This can also work for plantar warts. Potato skin has been known to accomplish the same thing. Rub a banana peel on small cuts or scratches and it can help promote healing. The enzymes help dislodge the splinter and can help kick-start the healing process if you tape a piece of the peel over a splinter for a couple hours. A banana peel can soothe the inflammation and irritation of acne. It also helps to prevent future outbreaks. Rub a peel over the acne every night. You should see a positive change within a few days. Once or twice a day, try rubbing a banana peel on a psoriasis-affected area. Bananas have properties to reduce itchiness, moisturize, and heal psoriasis. You should see a noticeable difference in only a few days. Poison ivy, mild rashes, dry skin, irritated skin and even sunburn. Banana peel is good for relieving itch and promotes healing of the skin. Rub the peel over the rash or affected area twice daily until it is gone. If you notice it getting worse you should see a professional. Simply take the banana peel and spread it out across your forehead and relax while the nutrients are absorbed into your skin. Regularly applying banana peel to your forehead, face or cheeks can tighten the skin, shrink pores and reduce wrinkles. Banana peels are great for polishing. After removing the stringy parts from the peel, rub away and watch the shine. One last reason and it's surely not the only use left, but we would advise you to always compost your unused food waste as it makes for great organic nutrient-rich soil to grow your future plants with. So remember these tips next time you go to throw away any peels! If you found this helpful and informative please help others reach this information by hitting one of the share buttons. Thanks for reading and we hope to see you soon. Make sure to follow us on Facebook if you wish to see more information like this in your newsfeed. I've Seen People Turn Garbage Into Some Cool Stuff. But THIS Is Absolute Brilliance!